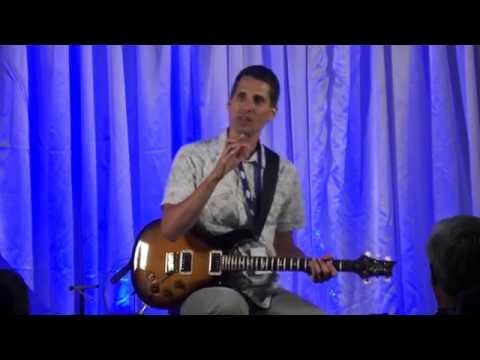 I was honored to offer a pentatonic scale workshop at Steve Krenz’s Guitar Gathering 2016 conference in Nashville, TN. Attendees traveled to Music City from around the country (and even a few from around the world) to hear me explain why guitarists learn scales, why the pentatonic scale has become so popular, what the scale-learning process looks like beginning to end, and how to put the scale patterns to good use by playing melodies, riffs, solos, and bass lines. Watch the embedded 52-minute video above. I cover the pentatonic and other essential guitar scales in my books Fretboard Theory and Guitar Theory For Dummies. 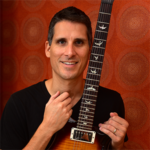 I also have hours of video instruction complete with tab, neck diagrams, backing tracks, and song lessons available on my website. Click the link for more information. Thanks for the referral to the video, Desi! I just trimmed about a minute off of the start (Steve’s groups announcements) so it will dive straight into you at the get go. It was a great presentation. Thank you. It was worthwhile to listen until the end. What is the pedal device you are using to record the chord progressions that you were turning around and playing the modes over? Are these the same as your backing tracks? Great presentation Desi, I been struggling with phrasing and I’m going to take your advice and use songs to learn the techniques I so very much want. Great Stuff !